I’ve been wanting to have the Eat Mendocino gals over for dinner and my mind has been in overdrive with all the possible recipes I could serve them. 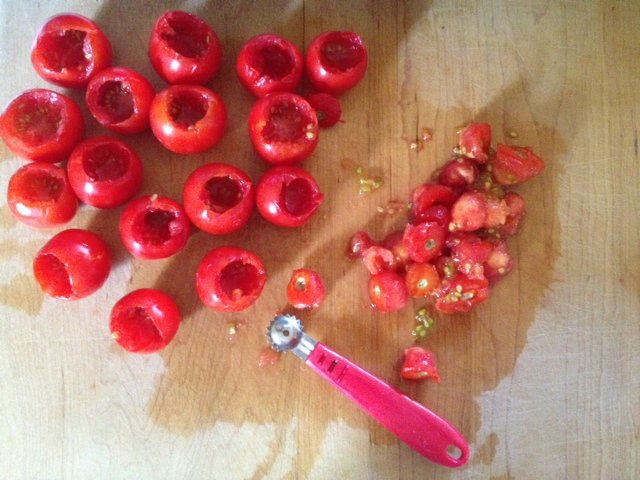 We’ve been enjoying ripe garden tomatoes for over a week now, and our Washington Red plant is especially prolific. They’re small to medium in size with great flavor but, unfortunately, tough skin. I took one to Anne at C&A Organics (my favorite farmer’s market vendor!) who sold us the plant, and she recommended stuffing them with almonds and bleu cheese and roasting them. Yes, please! My friend Brook came over for dinner last week, giving me a great opportunity to try out this recipe. I usually shy away from stuffed appetizers because they take FOREVER (hello mushrooms). However, these were pleasantly fast and fun to assemble. First, I scooped out the top with a strawberry/tomato corer. I briefly inverted them so some of the water would drain, salted them, and stuffed them with chopped smoked almonds and a hunk of bleu cheese. 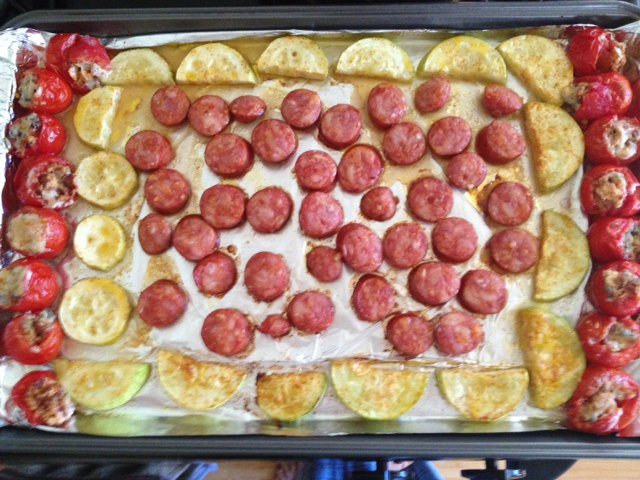 (Yes, I lined the pan with foil. I think it creates less waste than the water and soap required to scrub a dirty pan, not to mention time saved). Served with a garden salad, homemade sprouts, and Prosecco with a blackberry float, this was an awesome meal. The tomatoes were overcooked for my tastes, but when I made them again a few days later I got the cook time just right (about 6 minutes under broil). Sarah from Eat Mendocino is coming over for dinner tomorrow, and I think I’ll make this again with local walnuts and some local cheese from Ukiah’s Co-Op. 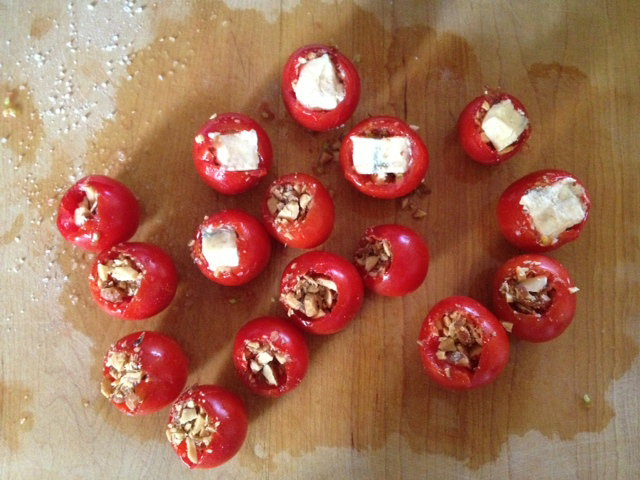 If you have an abundance of medium-sized tomatoes, I highly recommend experimenting with these stuffed beauties. ← I’m on the front page! Also pleasantly fast and fun to eat. That was an *amazing* meal!